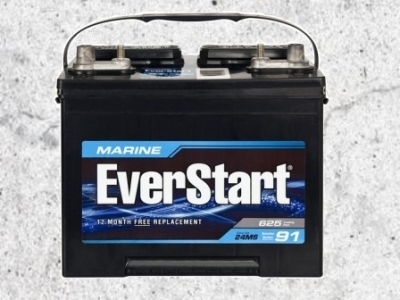 If you are shopping for a new battery, it is usually because your last one failed. Why did it fail? The most likely reason is neglect or abuse. 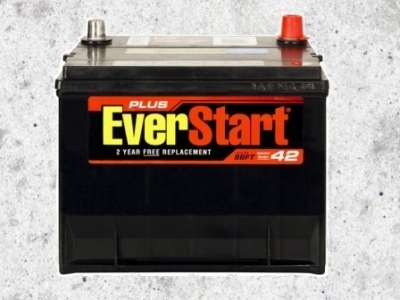 Once you get past the first week (which should always be covered by full warranty), all automotive starting batteries should far outlast their advertised pro-rata warranty period, if they are used properly. What does that mean? How do we use a battery right? Batteries must be used as they were designed to be used, or they will perform badly, and quickly fail. Automotive starting batteries must be kept fairly close to fully charged all the time. Automotive starting batteries are designed and intended for "starting" duty. They are sold by Group Size and rated in Cold Cranking Amps. When we go shopping for a battery, we want the best we can afford. Most of us will look for the highest CCA rating that will fit. I've done that myself. Then Tim Allen syndrome sets in (er er er), and we have to buy the biggest and baddest battery they have in the store. Buying the highest CCA rated battery is probably NOT the best choice for your tractor battery and maybe not the right choice for your car either. Once we have found a battery that meets the minimum CCA specification for our vehicle, more is not automatically better. How do you use your tractor? Does it often sit for several days, weeks, or even months between chores? If so, a less expensive battery, with a lower CCA rating, will often be the better choice! Why? The less-expensive battery, will often last longer because of the way we will be using it. In order to get maximum CCA ratings, the lead plates must be designed to have a very high surface area. Lead plates designed for starting duty are thin, light, and may have surfaces that almost look like a sponge. In normal starting duty, cranking the engine draws down less than 5 percent of the total charge in the battery. Any reasonably well-maintained vehicle will very rarely use more than 5 percent of the total capacity in a typical starting battery. Then, as soon as the engine starts, the battery is very quickly "topped off" by the charging system. This very short discharge, and immediate recharge is considered "starting duty". Battery manufacturers come up with some very aggressive plate designs to squeeze lots of CCA out of a small battery case. When we let our tractor, boat, motor home, generator, or lawn tractor for several days, weeks, or months, it will self-discharge as much as 5 percent per week! After only two weeks, some starting batteries may already be down to less than 90 percent charge! Once we drop below 90 percent, this is considered "Deep Cycle" duty. The very aggressive lead plates designed for starting duty are not intended to be used in a deep cycle application. Every time we dip into deep-cycle duty with a normal starting battery, we shorten its life, and may just kill it. This is why a fairly new dead battery will suddenly fail to take a charge. Typical starting batteries are not designed for deep-cycle duty. Deep-Cycle batteries are rated in Amp-Hours, and are usually much larger, heavier, and more expensive than starting batteries for the same CCA rating. 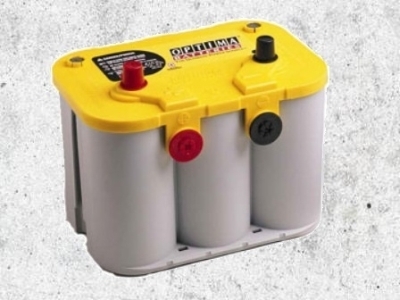 A deep-cycle battery may be a better choice for some tractors, equipment, and many vehicles. When we look at the cost, it can be very hard to justify buying a deep cycle battery. Some Marine and Tractor batteries are a "heavy duty" design that falls somewhere between starting, and deep-cycle duty. These types of batteries will usually have a stronger, more durable case and are better designed for the weekend warrior type of duty they will see. The tractor and marine batteries are also more expensive. Look at the choices we are given. Supply and demand is what determines pricing and value. They sell a lot more automotive starting batteries than any other type. There is plenty of competition between various brand names. Competition keeps prices lower, so the best value is nearly always going to be a standard automotive starting battery. Batteries with a lower CCA rating are generally going to have a slightly less aggressive plate design. The less-aggressive design should be stronger, and more forgiving of the occasional foray into deep-cycle mode. My tractors are rarely used more than 2 or 3 times a month, and can occasionally go as long as two months without being started. My choice is to buy the least expensive automotive starting battery I can find, from a large-volume retailer. Choose any battery that fits, and meets the minimum CCA specification for my tractor. Make sure positive and negative terminals are the correct type and located where they need to be to be. Do not get talked into spending more money for a higher CCA rating, or premium battery. Battery maintainers are nothing more than very small, fully-automatic, battery chargers. They are generally way too small to charge a dead battery in a reasonable amount of time. They are usually only intended to keep a battery at full charge. 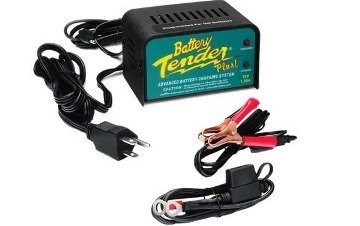 There are many brands, but if you want to buy a good one that will last, buy the original "Battery Tender" brand name product. Yes, they cost a little more, maybe even twice as much as others, but this is another case where you do get what you pay for. Buy the cheap ones, and you may soon be tossing the broken junk in the trash and buying new ones. These are two "Die Hard" brand maintainers that I bought because they were dual 6 or 12 volt. I thought that was a good idea, since I have an assortment of 6 and 12 volt batteries. I made cool little overhead shelves, so the cables would always be out of the way, but handy. All of the maintainers should come with a set of clip-leads, and a connector that can be hard-wired to the battery. I wire one of the connectors to each of my batteries. Make connecting them more convenient, and they will be used more often. Sadly, both of the Die Hard maintainers failed before they were 12 months old. There are several different models of the better maintainers. Two of them are pictured above; the Battery Tender Plus, and a Battery Tender Junior. I have had one of the Junior models for years. I should have known better than to buy some other brand. 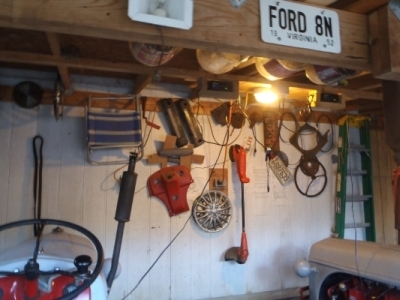 Many tractors are kept where there are no power outlets. For those, solar maintainers are available. Of course it does need to be a spot that gets some sun. I use one for our generator and another for the lawn tractor battery. We also put one on the dash of the car, plugged into the cigarette lighter socket, any time we leave a car sitting somewhere for more than a few days. It's nice to take "dead battery" off the list of things we might have to deal with when we get back from a trip. June 2016 - Had to buy a new battery for my Sears Craftsman lawn tractor. This lawn tractor was purchased new in April 2011 and this was the first replacement battery. That is 5 years of service out of a 3 year lawn tractor battery. Premium Batteries cost more than standard batteries, duh. Is the expense justified? That depends mostly on how much you are willing to pay for premium. The example pictured above is a unique "spiral-wound" design that many people prefer over more conventional batteries. Many sources claim Optima battery quality has declined since they were purchased by Johnson Controls. Compare warranty information and make your own informed decision. Personally, for my cars, tractors, and equipment, it makes no sense to pay premium dollars for batteries. For most brand name batteries, the only real difference is the color of the plastic, and the decal or logo printed on the case. Johnson Controls manufactures most of the popular brands. 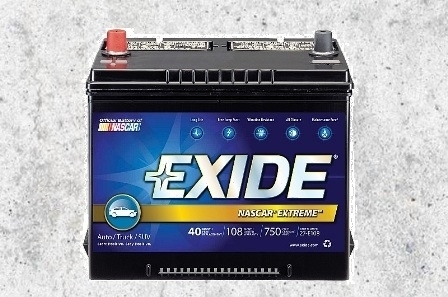 Two other large battery manufacturers are Exide and Delphi. Combined, these two do not sell as many automotive starting batteries as Johnson Controls. All battery sizes and types for a brand may not be built by the same manufacturer. Exide and Delphi manufacture some of the same brand name batteries as Johnson controls. Various name brand batteries are ordered by national retailers in large quantities. Those contracts vary by region, and battery group size. The successful bidder for each contract will change from time to time. It is nearly impossible to say which manufacturer made a particular brand and group size battery. Some branded batteries are simply made in the plant that happens to be closest to each retail distribution center. All automotive starting batteries sold by every major retailer should last about as long as their stated pro-rata warranty when used in the average car. Treat any battery just a little better than average, and it will last MUCH longer than the pro-rata warranty. There is no reason most 3-year batteries shouldn't last 6 or more years if they are treated well. When buying a new battery age is much more important than the brand name. A "new" battery might have been sitting on that dealer's shelf for a year or longer. Always buy batteries from a place that sells a lot of them. If they move a lot of product through the store, they should have new batteries on the shelf. Beware of batteries on SALE. They may be on sale because they have not been moving off the shelf fast enough. Check the "born-on" date yourself. All automotive batteries should have date codes stamped in the case that will tell you the date of manufacture. The date may be in plain English, or it may be a code. Look for something like "A-14" In this case the letter "A" probably means "January", and the number "14" would be "2014". Never buy a battery that has a "Born On" date more than six months old. Did anyone notice the concrete backgrounds on all the battery photos? The truth is that setting a modern battery on a concrete floor does not hurt the battery. A concrete floor is no better or worse than any other common floor or construction material for modern batteries in plastic cases. Setting them on the floor isn't the problem, neglect is what kills them. All automotive type Lead-Acid batteries will self-discharge over time, regardless of what we set them on. For some types of batteries this self-discharge is as much as 15 percent per month! This has nothing to do with the floor; self-discharge is normal for these types of batteries. Keeping the battery case clean helps a little, but we cannot prevent the internal self-discharge, unless they start selling Lithium car batteries. As a minimum, we should be topping-off our idle batteries 2 to 3 times a month. There are some good reasons not to set batteries or anything else directly on the floor. It is much easier to sweep the floor if everything is stored on sturdy shelves. Also, it can be inconvenient if a piece of hot welding slag rolls across the floor and melts through a plastic battery case, oil bottle, or gas can! No, I'm not a genius. I learned most of these things the hard way. In my case it was a 5-quart oil container. By the time I realized what had happened, about 3-quarts of oil was making a pond on my floor. Some people get a volt meter and think 10 volts on a 12 volt battery is pretty good. It's more than half, right? Wrong. As we can see from the charts below, 10 volts is nothing, and many starting batteries are not going to come back from a discharge condition this low. 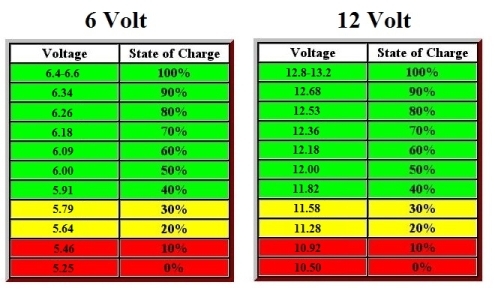 The following voltage chart is for typical starting batteries. It indicates the relative charge percentage for each voltage reading. These are static voltage readings taken with the engine off, and no-load on the battery. All new batteries should be fully-charged before putting them in service. I know, most dealers will claim their batteries are fully-charged, but that depends on how often they service their inventory. New batteries will usually be charged enough to start the engine, and take a charge, but if you check, I guarantee most new batteries are something less than full charged. 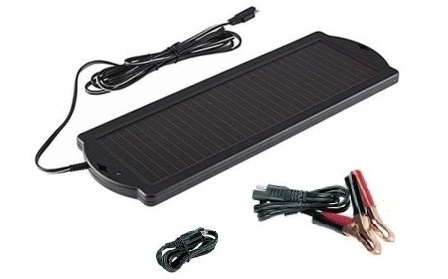 It's a lot easier on your charging system if the battery is fully-charged when installed. If you don't have an automatic type charger, get one. 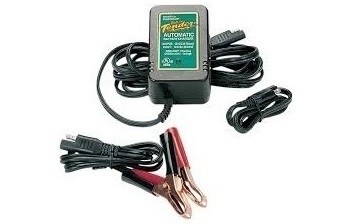 My 12 volt battery charger is an automatic type with two settings, 2 and 10 amps. I always use the 2 amp setting for charging batteries. Battery charging should only be done in a well-ventilated area. If it's indoors, open windows and doors to get some cross-ventilation going, or better, set your charger up where you can run the leads outside. Hook the leads up to the battery, plus-to-plus and minus-to-minus. The red insulated lead is usually plus. Check your charger manual, or look for a label on the charger. Make sure you are connecting plus-to-plus and minus-to-minus. Turn the charger on. It should have status lights or a meter that will tell you what it's doing. Automatic chargers start out at a higher rate and ramp down as the battery reaches full charge. It should only take a few minutes for the charger to top-off the charge. Longer if the battery has been depleted. If it appears to be functioning normally, just leave it for a while. Leaving an automatic charger ON after the battery reaches full charge won't damage the battery. I tend to get distracted doing other things (that untreated ADHD thing again), so automatic is the only way to go for me. In spite of our best efforts, sooner or later, we will be faced with a dead battery. If you can wait, the best thing to do is put a charger on it. If you cannot wait for that, or the battery won't take a charge, Pull-Starting is an option. Pull or Push-Starting is simply using another vehicle or a few friends to get the tractor rolling in gear, then letting the clutch out to help crank the engine. If you are working alone, jump-starting may be the best option. If your tractor is 12-volts, jump-starting is no different than jump starting a car. If your tractor is 6-volts it can be a little more complicated if the only available vehicle is 12-volts. PLEASE DO NOT connect a 12-volt battery to a 6-volt battery. Battery explosions are rare, but connecting twice the rated voltage, to a battery that is obviously in less than ideal condition, is one of the best ways I know to create conditions for an explosion. What follows are the safe ways to jump-start your dead tractor. BOTH VEHICLES = SAME VOLTAGE Most people already know how to jump start when the systems are the same voltage. The vehicle with the good battery should be running at a fast idle. With two batteries of the same voltage ALWAYS connect Plus-to-Plus, and Minus-to-Minus. The last connection should never be made directly to the battery. It will likely spark, and we don't want to be making sparks around a battery. That's another way to create one of those rare battery explosions. Decide which vehicle you want the last connection to land on. It does not matter which vehicle. Look at the battery in that vehicle to see which post is grounded to the vehicle frame. That is the clamp that will be connected last, and we will connect it to a solid metal part of the vehicle at least a few feet away from the battery. That will be electrically the same as connecting to the grounded battery post, but a lot safer. Once the cables are connected the good vehicle will begin putting a charge on the dead battery. I usually wait a minute or so at this point, because the more charge we put in the dead battery, the better. Finally step on the clutch and start the dead tractor as you normally would. Once it's running, disconnect jumper cables one at a time. Check your amp gauge, if it's charging, you should be able to go ahead and do whatever you were originally planning to do. DEAD 6-VOLT TRACTOR USING 12-VOLT VEHICLE OR BATTERY - It's better if the 6-volt battery still has some charge in it. If the solenoid goes CLiKKK or BuZZz, when you hit the start button, the battery has enough charge to run the ignition. In this case polarity does not matter, because we are NOT going to connect the two electrical systems together. Polarity makes no difference to the starter motor. It can't spin backwards; it always turns the same way. In this case, there is little benefit to having the donor vehicle running. Make absolutely sure the tractor transmission is in neutral, and then block the clutch pedal down. This does two things. Disengaging the clutch removes a good bit of load from the starter, so the engine will crank easier. Blocking the clutch is also double insurance that the tractor cannot run you over. Connect one jumper cable from either post on the good battery to the power lug on the starter motor. Make sure this cable clamp only touches the electrical connection, not the metal starter housing. Turn fuel and ignition ON. Connect the second jumper cable from the second post on the good battery and just touch it to any good ground on the tractor. Usually the foot peg or foot board will have enough paint rubbed off. The starter should immediately crank the engine when you touch that cable. Use your third hand to work the choke, throttle, or whatever else you usually do to start it.